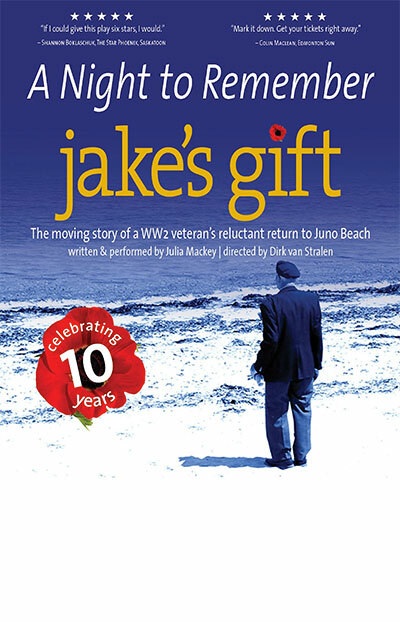 Jake's Gift is a multi-award winning Canadian play about a World War II veteran's reluctant return to Normandy, France, for the 60th Anniversary of the D-Day landings. While revisiting the shores of Juno beach, Jake encounters Isabelle, a precocious 10-year-old from the local village. Isabelle's inquisitive nature and charm challenge the old soldier to confront some long-ignored ghosts - most notably the war-time death of his eldest brother, Chester, a once promising young musician. 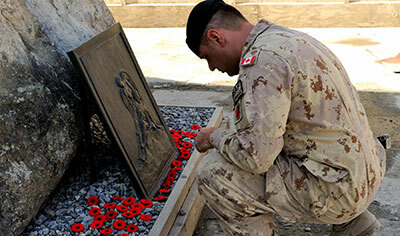 At its heart, Jake's Gift is about the legacy of remembrance and makes personal the story behind one soldier's grave. Since 2007, Jake's Gift has gone on to play at festivals and theatres in 240 communities across Canada, including International stops to Washington State, the UK and to Normandy, France, for the 70th & 73rd Anniversary of D-Day. The company hopes to return to Normandy in 2019 for the 75th Anniversary of D-Day. The production is available in English and French. 2017 marked their 10th year of touring, and Juno Productions and Jake's Gift continue to garner awards and rave reviews whether playing in small rural towns or big city centres. Issue #669: The Fringe of What? Jake's Gift is a deeply moving play about a young French girl and a Canadian war veteran who visit Juno Beach for the 60th anniversary of D Day. They strike up an unlikely friendship and both learn about the losses and gains of war. A late addition to the festival, this play was not even in the program and yet deservedly had a nearly full house on opening night. Julia Mackey, who wrote and stars in the play, is an eminently watchable actor and her transformations between characters are stunning and nuanced, right down to the perfectly angled arthritic fingers of Jake. This is one to watch. Former Montrealer, Julia Mackey, is making a triumphant return to her former hometown with her solo play Jake's Gift, which also opened at the Wildside this week. It's a poignant piece, directed by Dirk Van Stralen, about a Second World War veteran who visits Juno Beach on the 60th anniversary of D-Day. Single-minded in its desire to pay homage to those who fought and died for their country, Jake's Gift leads, artfully and predictably, to a two-hanky ending. A grumpy WWII veteran meets a precocious 10-year-old girl during a visit to Juno Beach in Normandy, at the time of the 60th anniversary of D-Day. This economical one-woman show is impressively written and performed by Julia Mackey, and should be a great draw for younger kids and their grandparents. The narrative itself is fairly clichéd, and the conclusion too obviously attempts to tug at our heartstrings, but this is largely a successful and tasteful production.